Your bedding is the centerpiece of your bedroom decor or dorm room decor. Your bedding essentials are often where your decor starts and your other bedroom decorations will complement and complete the style you are creating for your bedroom. For the best style and comfort you can find, take a look around at our Textured Comforters. The design and style of these bedding essentials will make your bedroom a comfortable and relaxing oasis. Creating the perfect home decor throughout your home is important right down to your bedroom. You want your bedroom to have as much great style as the rest of your home has. Great bedroom decor starts with your comforter. 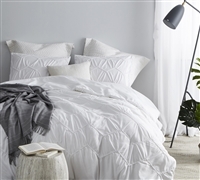 For a unique look that makes you love to come to you bedroom to rest, relax, and get a restorative night's sleep, look no further than our textured comforters. Our textured comforters will make your bed the centerpiece of your bedroom decor and will freshen up your bedroom style.